Just to start a blog...that was my SINGLE goal! After graduating with my Master's degree in May, I felt the need to do something intensely creative after years of studying textbooks, reading scholarly articles, and writing highly structured research papers and reports. Makeup, beauty, style, and writing have always been my true creative passions; the things I LOVE to do instead of HAVE to do. 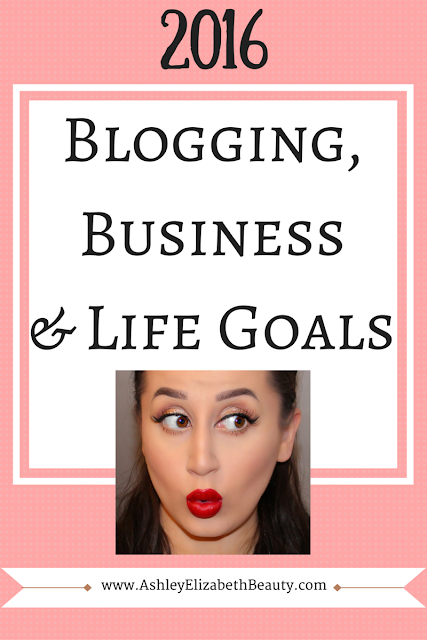 When I came up with the idea to start a beauty blog I knew it would be a lot of work, but I didn't quite realize how much time, effort and organization goes into making any type of blog successful. With a lot of encouragement from friends and family (and especially my support from Brandon, who encourages me to be true to myself every single day), this little thing that I started at the end of August has really grown into something amazing! 1. Create a YouTube channel. I am starting off this list with one of my most important goals. I have felt for some time now that a YouTube element to this blog is increasingly necessary. One of my favorite types of posts to create are tutorials, and this might be best served in video format. Not to worry! Tutorials will remain here on this blog, only there will also be a video component involved as well. 2. Create and send a weekly newsletter. I need to get my crap together and just do this! I have so many ideas, but have not put them together in any kind of organized manner. My goal is to invest in a mail service to create a newsletter that is inviting, informative, and will drive more visitors to my blog. 3. Increase my blog subscribers and social media followers. The goals: 1K Bloglovin' subscribers, 20K Twitter followers, 10K Instagram followers, and 500 newsletter subscribers. 4. Enroll in e-courses. In order to turn this blog into a full business, I know I will need to hone in on more entrepreneurial skills. There are two lovely bloggers that I follow religiously, The Nectar Collective and Helene In Between, who both offer e-courses that look amazing and very informative. 5. Reach 75K monthly page views by the end of 2016. My monthly page views have been increasing at a steady amount since my first blog post at the end of August, and I am happy with the direction. I hope to reach this number (or higher!) by taking initiative with my other blog goals and driving more traffic towards this site. 7. Publish an e-book. It has always been a goal of mine to become a published author. I do not expect publishing an e-book to be easy. As a matter of fact, I expect it to be intensely time consuming, but also incredibly rewarding. I have many, many ideas in the works for this, so stay tuned! 8. Start freelance writing. I absolutely love writing, and I have for as long as I can remember. My goal for 2016 is to get my freelancing business off the ground. I am still in the process of searching for platforms and working out the design details. Suggestions from any readers experienced in this area are happily welcomed! 9. Create my first free info product. I want to be able to offer my readers the most they can possibly get out of this blog, and that absolutely includes offering free stuff! My plans are to create helpful info products to help readers navigate the basic of beauty, makeup and style, and to offer it at the end of every blog post. 1. Read more physical books. I love to read, I always have, but somehow in the shuffle of the every day hustle I tend to put this love on the back burner. Instead of scrolling through Facebook and checking my Twitter and Instagram feeds every night, my goal is to read a book. 2. Improve upon my running. I have never been a "runner." I have always struggled with this area of exercise, which is probably why I have gravitated more toward yoga and Pilates. Brandon is great at running, and I always feel a little twinge of jealousy towards "those people" that can run for miles and miles without a second thought, while I start heaving not even one mile in. I will do more research on proper running techniques, learn to build up my stamina, and perhaps have a 2017 goal of a 5K or half marathon. 3. Turn an apartment into a home. Sounds vague, right? It's actually meant to be...Some very exciting "things" are going to be happening in early 2016. Don't worry, details to come in time! 4. Travel more. These plans are already in the works with details to come! However, I will say that my current travel list includes: United States - New Orleans, Las Vegas, San Fransisco, Yellowstone National Park, Sierra National Forest, Sequoia National Park, and Yosemite National Park. Europe - Germany, France, and Belgium. Are you an AEB Babe? Sign up for our newsletter!